What should one do with a healthy amount of leftover salted caramel? Eat it by the spoonful (guilty), top an apple with it (apple bathed in caramel > yawn.com apple), OR create an ice cream sundae bar around it? YES. I was into this sundae bar concept because it sounded fun, interactive, pretty low effort and it happened to be Sunday as well. The beauty of it is that it's a no-fail dessert that you can dial up or down as much as you'd like. I decided to dial it up to 11 because that's what I do. 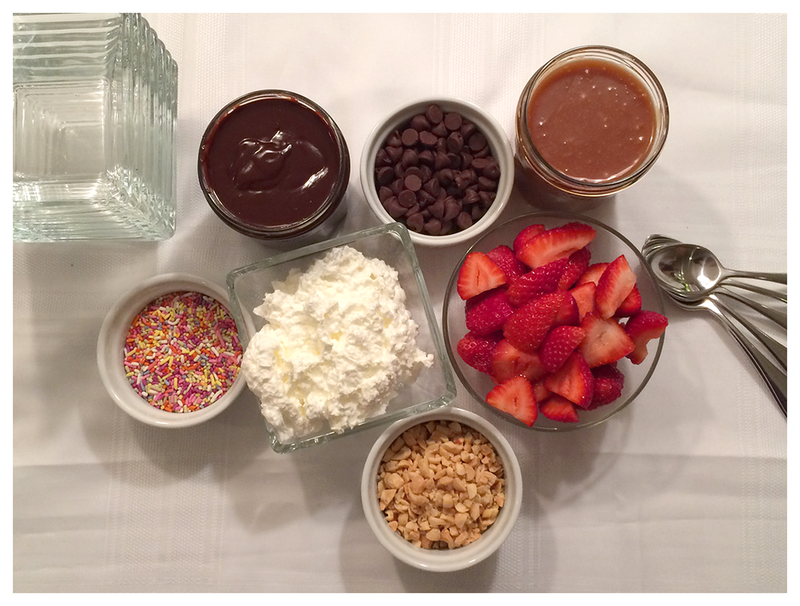 I crafted two sundae bars- one for a Game of Thrones viewing party (sundaes and strong adult content go really well together) and one for a family get together (fun for the whole famn damily!) I am pleased to report that both were smashing successes. •Ice Cream: Several pints, several flavors. Definitely get Vanilla and Chocolate at the very least. My personal sundae favorite: Mint Chocolate Chip. Want to make your own? We loved the Vanilla Bean Ice Cream my hubs made. Recipe below. 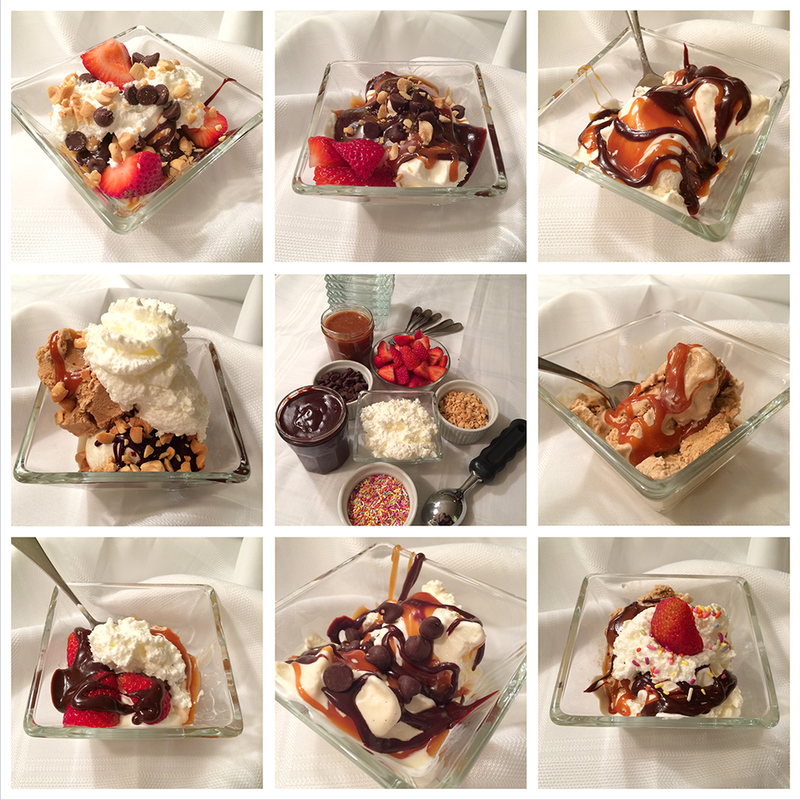 •Hot Fudge & Caramel Sauce: You've gotta have a hot situation for your ice cream to sit in and get drizzled upon. It's a must for a sundae. Along with Salted Caramel Sauce, I made Hot Fudge Sauce (both recipes below). Feeling lazy? Snag one of these and these. I won't judge. •Toppings: Chopped roasted peanuts, Mini Chocolate Chips, Mini Butterscotch Chips (mini is my pref, but regular-sized is cool too), Rainbow or Chocolate Sprinkles. •Baked Good: A Chocolate Chip Cookie or Brownie provide a lovely base or topper to your sundae. •Whipped Cream: One pint with 4 T sugar should be enough to heavily dollop your finished masterpiece. Beat cream until soft peaks form. •Maraschino Cherries: Optional. I'm a sucker for these, but some say they are terrible for you <shrugs and pops cherry in mouth>. Pro Tip: My mom told me when she was a waitress back in the day, her insider tip for making pretty sundaes was to first spread the sauce all along the inside walls of the glass with the back of a spoon. It looks fancier and gives you a better sundae eating experience. She also mentioned that it gives you the illusion of having more sauce than you actually do. Sneaky sneaky. Thanks madre! ¼ cup Dutch-processed cocoa powder Pro Tip: How to know if it's Dutch? If it doesn't say those exact words on the package, look for "processed with Alkali" in the ingredients. 6 ounces bittersweet chocolate, chopped, divided in half. Pro Tip: I tried both Ghirardelli & Scharffen Berger and preferred the latter simply because it was richer. 2. Remove from the heat and stir in the remaining chocolate, the butter, and the vanilla extract, stirring until smooth. Let cool for 20 to 30 minutes before using (it will thicken as it cools). Store in a jar or airtight container in the refrigerator for up to 2 weeks. To reheat, microwave for 30 seconds to 1 minute until it's pourable but still thick. 1. Combine the sugar and 1/3 cup water in a medium heavy-bottomed saucepan. This is the only time you can stir the sugar. If you stir it while it's cooking, it turns to rock candy. Place the saucepan over medium to low heat until the sugars start to dissolve, 5 to 10 minutes. Then turn the heat up to medium-high and cook until the sugar starts to caramelize, 5 to 7 minutes (Pro Tip: this took me more like 9 mins). Do not stir while this is happening. You've got to watch the pot, because it goes from caramel to burnt really quickly. And be careful, the mixture is extremely hot! 2. Turn off the heat and stand back to avoid splattering. Slowly add the cream. Don't panic - the cream will bubble violently, and the caramel will solidify. Just give it more time to liquefy again-trust me! 3. Simmer over low heat, stirring constantly, until the caramel dissolves and the sauce is smooth, about 2 minutes. Pro Tip: if your caramel is too liquidity (mine was 5/6 times I've made this), simmer over medium-low heat for 5-10 minutes. It's not a bad idea to do this regardless for 5 mins, just to be safe. 4. Allow the sauce to cool to room temperature, at least 4 hours. It will thicken as it sits. Stir in salt. Pro Tip: I transferred mine to a container after 2 hrs, it was cool enough. 1. Whip the eggs and sugar together with a whisk until fluffy (but not firm). 2. Add the rest of the ingredients into the eggs and sugar. Whisk together until well mixed. 3. Place in ice cream maker and follow it's directions to make. Pro Tip: Make sure your ice cream maker container has been in the freezer for at least 24 hours or else the ice cream won't get cold enough and fully form.